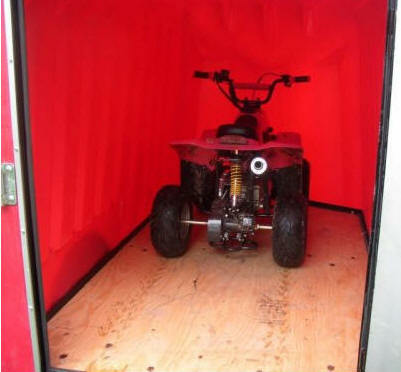 HOME OF 57 VARIETIES OF TRAILER, FROM SMALL OPEN OR ENCLOSED CARGO TRAILERS FOR CARS AND MOTORCYCLES, TO ENCLOSED TRAILERS CAMPING TRAILERS AND TO CARRY MOBILITY SCOOTERS AND POWER CHAIRS ATV, ETC. THIS PAGE SHOWS ALL MODELS. VERSA ULTRAHIGH VLUB42 IN PHOTO AT THE LEFT. 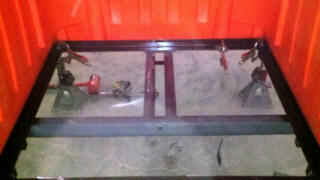 ALL WELDED FRAME IN 16, 21, 32, AND 42 CU. FT. MODELS. CARRY 1000 LBS. 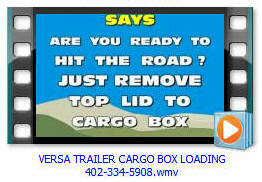 VERSA REAR OPENING model can be removed from the trailer and carried in the bed of your truck. SIDE OR REAR LOADER MODELS ALL WELDED FRAME IN 16, 21, 32, AND 42 CU. FT. MODELS. CARRY 1000 LBS. ECONOMY SPRING MODEL ULTRA LIGHT FRAME , 4FT. X 6 FT. LONG ALL WELDED FRAME IN 16, 21, 32, AND 42 CU. FT. MODELS. CARRY 1000 LBS. HAVE 1 7/8 IN BALL COUPLER, 4 FLAT WIRING. OPTION: BATTERY BOX. ECONOMY SPRING MODEL HD FRAME 4FT. X 6 FT. LONG ALL WELDED FRAME IN 16, 21, 32, AND 42 CU. FT. MODELS. CARRY 1000 LBS. HAVE 1 7/8 IN BALL COUPLER, 4 FLAT WIRING. 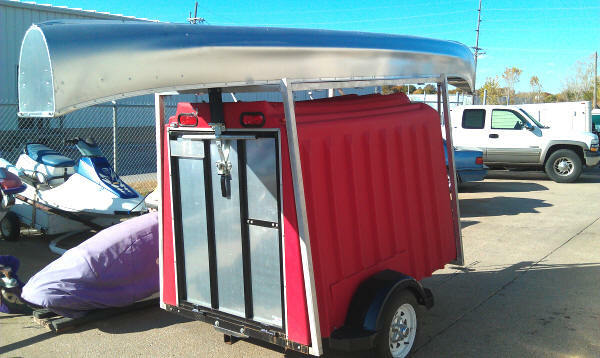 WE MAKE THE YUPPIE TRAILERS TO CARRY SCOOTER AND POWER CHAIRS, AND FOR CAMPING, OR AS A GENERAL USE CARGO TRAILER. EASY PAYMENTS USUALLYFROM$44.00 TO $88.00 AVAILABLE WITH NOTHING DOWN. 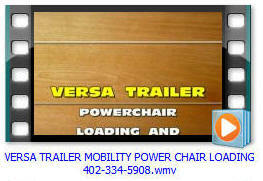 YUPPIE MOBILITY TRAILERS ARE THE MOST AFFORDABLE MOBILITY TRAILER MADE ! # 1 THEY ARE FUEL FRIENDLY! 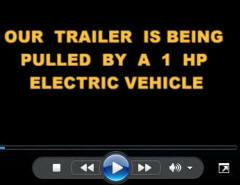 EZ TO TOW TRAILERS CAN EVEN BE PULLED WITH ELECTRIC CARS. YOU WILL HARDLY KNOW YOU ARE TOWING IT. ALUMINUM OR STEEL TRAILERS USE ABOUT 6 MPG MORE FUEL THAN OUR ROTO MOLDED EZ TOW TRAILERS! OUR EZ TOW TRAILER WEIGHS EVEN LESS AND IS 6 INCHES LOWER FOR EASIER LOADING. 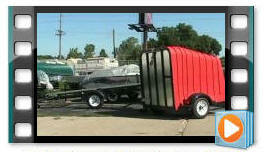 YOU WILL LOVE OUR EZ TOW TRAILER. IT IS EASY TO TOW AND IS ENCLOSED, MULTI USE TRANSPORT TRAILER. OUR EZ TO TOW TRAILERS WERE DESIGNED FROM THE GROUND UP. OUR EZ TO TOW SMOOTH RIDING EZ LUBE TORSION AXLE TRAILER FRAME IS ALL STEEL AND THE TRAILING SUSPENSION HAS A PRELOADED WEIGHT OF 20 % OF ITS CAPACITY SO EVEN WHEN EMPTY IT TRAVELS DOWN THE ROAD AS SMOOTH AS WHEN LOADED WITH UP TO A 1,000 LB. LOAD. EZ TOW TRAILERS ARE PREFERRED FOR DELIVERY OF DELICATE COMPUTER, ELECTRONIC AND MEDICAL EQUIPMENT. # 1 FOR HANDICAPPED SCOOTERS AND POWER CHAIRS. THE UNDER FLOOR FRAME WITH HEAVY MULTIPLE CROSS MEMBERS PROVIDE PLENTY OF FLOOR SUPPORT. EZ TOW, YUPPIE WAGON, PULMOR, AND VERSA TRAILERS COME EQUIPPED WITH EASY REMOVABLE EXTENDED TONGUE WITH TONGUE HANDLE, UNDER TONGUE COUPLER GUARD, 4 FLAT WIRING, AND 2 INCH COUPLER. EZ LUBE TORSION AXLE. LARGE 7 FT. LONG X 4 FT. 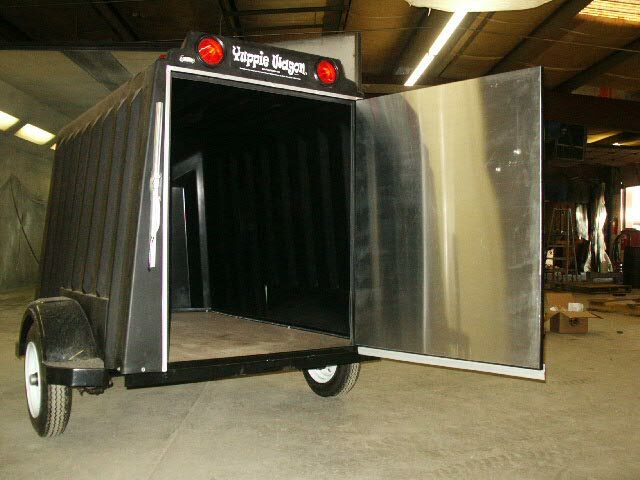 WIDE IS OUR NEW MODEL CALLED THE YUPPIE WAGON MOBILITY TRAILER. SPECIAL 3 POINT TIE DOWN SYSTEM IS AVAILABLE TO SECURELY HOLD YOUR MOBILITY SCOOTER OR POWER CHAIR IN PLACE SO IT CAN NOT SLIDE AROUND IN THE TRAILER. PLENTY OF ROOM FOR A SECOND, OR ROOM FOR OTHER ITEMS, ETC. EVERY TRAILER IS HAND FITTED BY EXPERIENCED FACTORY TRAINED EMPLOYEES. USE YOUR TRAILER TO CARRY OTHER ITEMS. WATCH THIS NEXT MOVIE BELOW ON LOADING OTHER ITEMS. 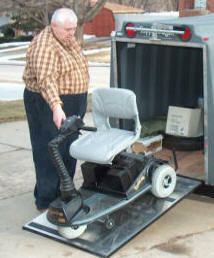 LARGE YUPPIE MOBILITY TRAILER IS 45 X 42 INCHES HIGH, REAR RAMP DOOR OR EZ OPEN CLOSE MOBILITY REAR RAMP. DID YOU WATCH SHORT MOVIE ABOVE ON EZ CLOSE RAMP. 12 INCH GROUND TO FLOOR. DOOR WIDTH IS 45 X, HEIGHT 41 INCHES. ON ON YUPPIE WAGON. 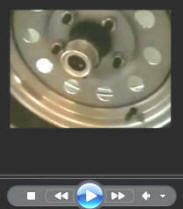 WATCH MOVIE ON LOADING EQUIPMENT. 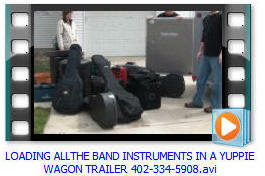 THEN YUPPIE TRAILER IS GREAT FOR HAULING ALL KINDS OF THINGS. 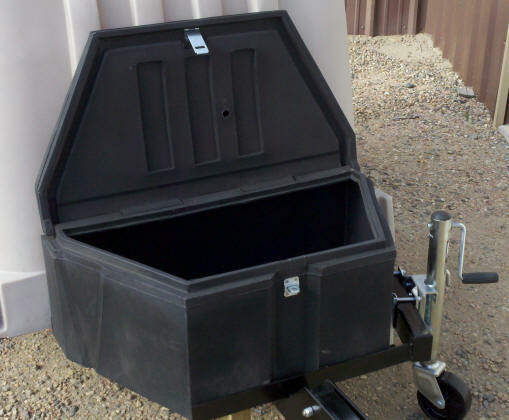 OUR TONGUE MOUNTED ACCESSORY BOX FOR OUR YUPPIE MOBILITY OFFERS A COMPACT VEE BOX, YET LARGE ENOUGH TO CARRY EVEN THE 8 AND 12 INCH FULLY INFLATED SPARE TIRE AND WHEEL AND A JACK, WITH ROOM FOR MEDICAL ACCESSORIES OR A ELECTRIC TIRE INFLATOR, WHEEL CHOKES, ETC. OUR OPTIONAL TONGUE MOUNTED ACCESSORY BOX AND OUR SWING UP TONGUE AS IN PHOTO IS PICTURED HERE WITH OPTIONAL SWING UP TONGUE JACK WITH ROLLER WHEEL. 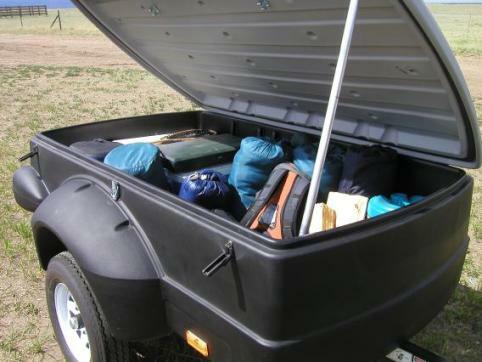 LARGE ENOUGH TO CARRY THE 8 AND 12 INCH FULLY INFLATED SPARE TIRE AND WHEEL AND A JACK, WITH ROOM FOR ADDITIONAL ACCESSORIES LIKE A ELECTRIC TIRE INFLATOR, WHEEL CHOKES, BATTERY, JUMPER CABLES, TOOLS, MEDICAL EQUIPMENT, ETC. OUR ROTO MOLDED TRAILER BODIES CAN WITH STAND SCRATCHES, BANGS AND HARD BLOWS. AND THEN DROPPED FROM THE AIR. THE VERSA TRAILER IS A 12 IN 1 TRAILER FOR EVERYTHING FROM SNOW BOARDS, TO CAMPING GEAR. 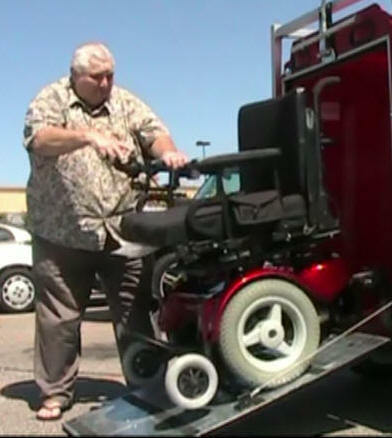 The EZ TOW Trailer is a simple alternative to an internal lift or hitch mounted carrier for transporting power wheelchairs and mobility scooters. Because the EZ TOW Trailer has its own wheels, it places only 35 to 65 pounds on your vehicle's hitch. This means that its compatible with small cars like the Ford Focus or Chrysler PT Cruiser. 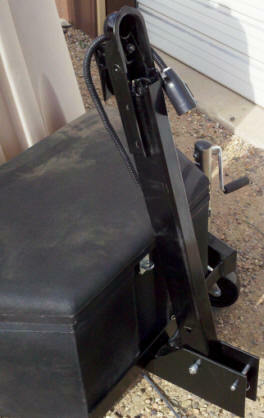 Loading your power wheelchair or mobility scooter on the EZ TOW Trailer is a breeze. Just lower the REAR RAMP (which requires only 9 TO 12 OUNCES of force) and guide your chair or scooter Into the TRAILER, secure it, and raise the REAR RAMP gate up, WITH OPTIONAL EZ RAMP which requires only 9 TO 12 OUNCES of force. That's it. The EZ TOW Trailer's EZ LUBE AND torflex Torsion suspension minimizes trailer bounce, so there is no need to worry about a rough ride, either. 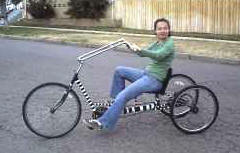 ALL OF OUR EZ TO TOW TRAILERS WILL CARRY EVEN WIDE TRIKES LIKE THIS 42 INCH WIDE MODEL. REAR RAMP DOOR OPENS FROM THE TOP FOR EASY ENTRY. 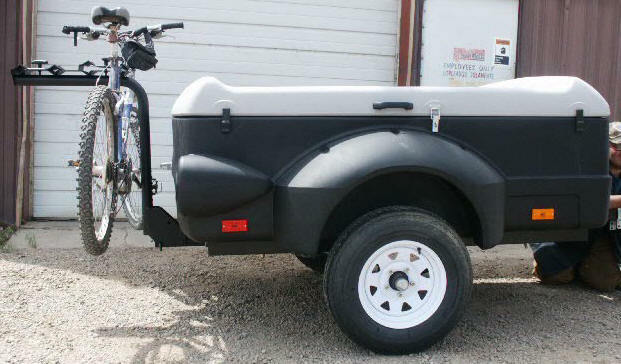 OPTIONAL RECEIVER IS 2 INCH AND ALLOWS YOU TO CARRY BIKES, BBQ GRILLS, PULL SMALL TRAILERS BEHIND. OR TO MOUNT A VARIETY OF OTHER ACCESSORIES. THE ACCESSORIES AVAILABLE ARE ENDLESS. 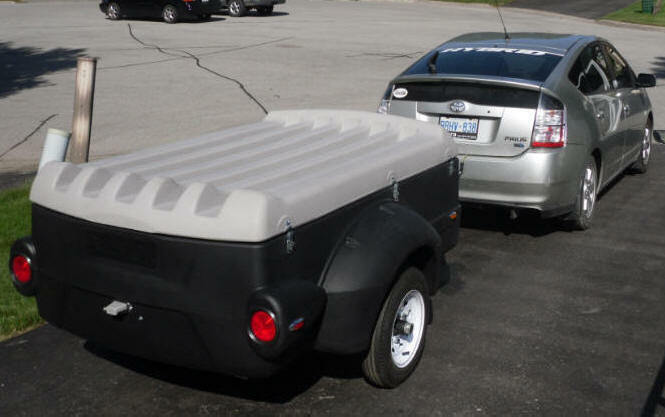 THE EZ TO TOW TRAILER IS AT HOME IN THE CITY, AT THE LAKE, IN THE MOUNTAINS, AT THE RANCH, OR ON THE FARM. THE USES FOR THE EZ TO TOW TRAILER IS ENDLESS. CALL 402-334-5908 FOR EASY PAYMENT PLAN. 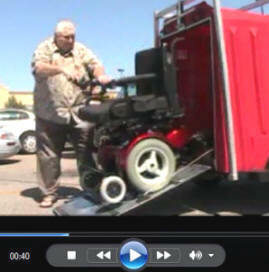 THE EZ OPEN / CLOSE REAR RAMP DOOR FOR WHEELCHAIRS AND SCOOTERS ELIMINATES THE PHYSICAL EFFORT. 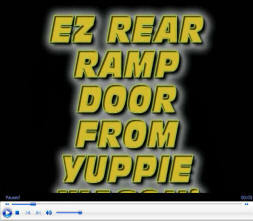 EZ REAR RAMP DOOR IS AVAILABLE ONLY ON EZ TOW, AND YUPPIE WAGON TRAILERS. 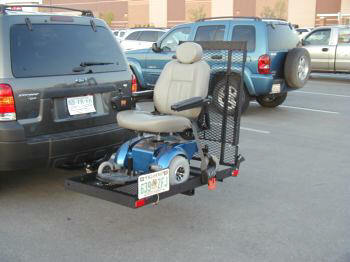 TRAILERS ARE GREAT FOR POWER CHAIRS. 4.80 X 12 INCH B RANGE TIRES AND 5 LUG WHEELS ARE STANDARD. THIS GIVES YOU A NET CARRYING CAPACITY OF 1000 LBS. 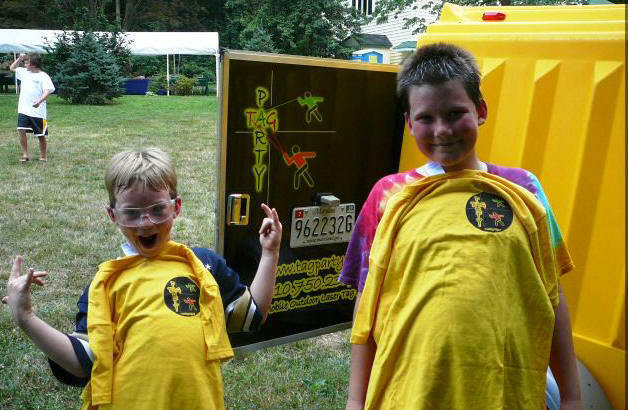 OUR TRAILER ARE POPULAR AT PAINTBALL AND LASER GAMES. 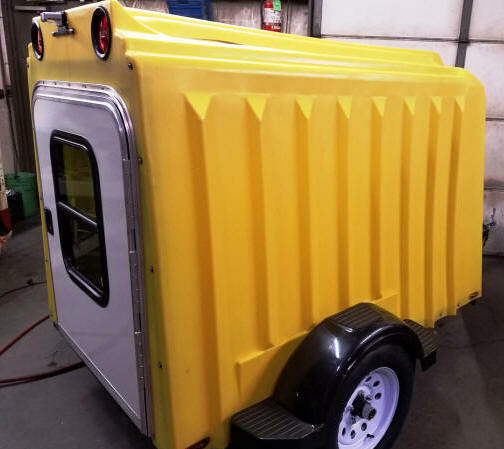 THE EZ TOW DOOR IS 46" WIDE AND 46" HIGH THIS IS 10 INCHES WIDER THAN OUR YUPPIE WAGON TRAILER AND 5 INCHES TALLER AND ALLOWS FOR LARGER ITEMS TO BE PLACED IN THE EZ TOW TRAILER. SAVE $$$ NOW SALE ON NOW ! LOOK AT ALL THE ROOM! THIS IS A PHOTO OF THE VEE TONGUE MOUNTED ACCESSORY BOX. PICTURED WITH TILT UP TONGUE JACK WITH ROLLER WHEEL. WE USED A FORK LIFT SO YOU COULD SEE THE UNDERSIDE OF OUR TRAILERS. 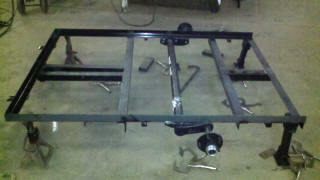 THIS PHOTO SHOWS OUR LONG HEAVY GAUGE STEEL FRAME THAT SUPPORTS THE AXLE AND TRAILER TONGUE. THIS PHOTO SHOWS OUR TORSION FLEX 2200 LB AXLE MOUNTED TO THE UNDERSIDE OF THE TRAILER FRAME. THE TORSION AXLE PROVIDES A VERY SMOOTH RIDE EVEN ON THE ROUGHEST OF ROADS. SEE CLOSE UP BELOW. COMBINED WITH OUR EASY LUBE HUBS PICTURED BELOW WE OFFER YOU THE BEST AXLE, HUB LUBRICATION SYSTEM POSSIBLE AS STANDARD, WHEN OTHER COMPANIES CHARGE UP TO $120.00 ADDITIONAL. THe features of the TORSION rubber suspension axle include the hexagonal outer tube which houses three separate rubber cords at each end of the axle. This provides 120 degree angles in which the rubber cord can roll. The wider angles optimize the shock absorption capability by allowing increased swing arm travel. As depicted here, the axle offers fully independent suspension and virtually eliminates side to side shock transfer. 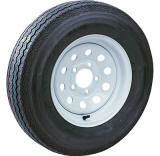 TORSION AXLES ARE ALSO USED ON OUR PULMOR, AND YUPPIE AND VERSA TRAILERS. THIS IS WHY OUR OWNERS KEEP REFERRING NEW CUSTOMERS TO US. WE USE THE BEST TORSION AXLE MADE IN THE USA. OUR EZ TO TOW, YUPPIE WAGON GIVES THE SMOOTHEST RIDE ON THE ROUGHEST OF ROADS. INCLUDED FREE ARE TORSION, EZ LUBE HUBS! BELOW IS OUR HUB AND AXLE SPINDLE LUBRICATION SYSTEM! EZ LUBE HUBS ARE THE BEST! AND WILL SAVE YOU HUNDREDS OF DOLLARS IN MAINTENANCE OVER THE LIFE OF THE TRAILER! OTHER COMPANIES CHARGE $120.00 MORE. EZ TOW AND YUPPIE WAGON TENTS ARE MADE TO FIT ALMOST ALL SUV, JEEP, HONDA ELEMENTS, AND MINI VANS. SLEEP IN THE TRAILER ON A SMOOTH SURFACE AND WAKE UP IN THE MORNING REFRESHED. 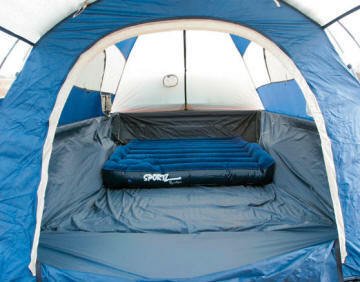 EZ TOW TENTS ATTACH TO SUV, VANS, CROSSOVERS, MINI VANS, AND ALL EZ TOW AND YUPPIE WAGON TRAILERS. MOST MODELS AVAILABLE FOR EASY PAYMENTS OF $44.00 TO $89.00 USUALLY NOTHING DOWN. BEST BUY DEALERS SELL YUPPIE WAGON AND PULMOR ENCLOSED ROTO MOLDED TRAILERS WITH STEEL AND IRON FRAMES. THE CHASSIS HAS A EZ LUBE HUBS INSTALLED AS STANDARD EQUIPMENT. OTHER MANUFACTURES CHARGE UP TO $120.00 EXTRA FOR THIS FEATURE. 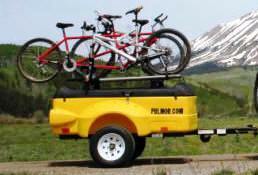 PULMOR TRAILER FOR YOUR NEXT OUTING. THE PULMOR ADDS THE EXTRA CARRYING CAPACITY YOU NEED FOR ANY OCCASION. 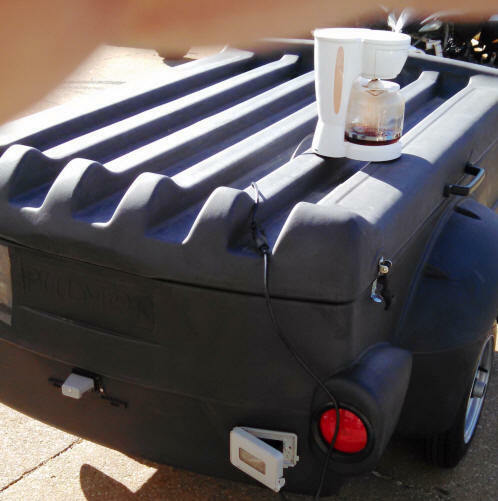 THE PULMOR TRAILER BODY COMES IN A VARIETY OF COLORS SO YOU CAN MATCH THE BOTTOM WITH THE LID COLOR YOU WANT. THE WEIGHT OF THE PULMOR IS SO LIGHT THAT YOU WILL GO DOWN THE ROAD AND HARDY KNOW YOU ARE PULLING A TRAILER. 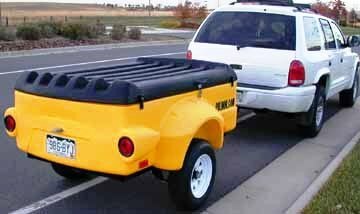 IN MOST VEHICLES YOU GET A FULL VIEW OF THE REAR AS THE HEIGHT OF THE TRAILER IS LOW TO THE GROUND. 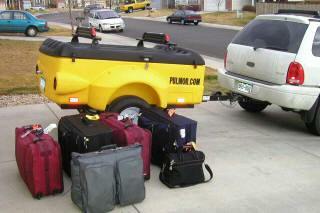 LET THE PULMOR TRAILER MAKE YOUR NEXT TRIP, BE YOUR BEST TRIP EVER! OUR PULMOR TRAILER CAN HOLD 6 DIVIDERS FOR SEPARATING YOUR EQUIPMENT. 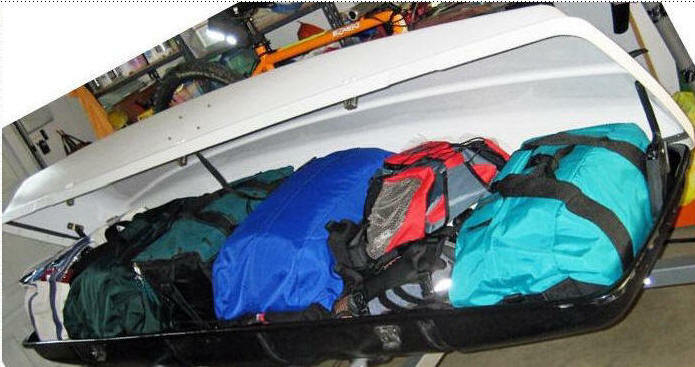 OPTIONAL ROOF RACK CARRIES LUGGAGE, LUMBER, LADDERS, CANOES, KAYAKS, PADDLE BOARDS. WIDE CROSS BARS AVAILABLE. WE HAVE A CONFIGURATION THAT WILL WORK FOR YOU! WE HAVE A POWER TRAILER CONFIGURATION THAT CAN BREW COFFEE OR RUN A SAW, DRILL, OR WHAT EVER, WE HAVE ONE THAT WILL WORK FOR YOU! THIS COULD BE YOU FOR JUST $44.00 TO $88.00 A MONTH. The features of the TORSION rubber suspension axle include the hexagonal outer tube which houses three separate rubber cords at each end of the axle. This provides 120 degree angles in which the rubber cord can roll. The wider angles optimize the shock absorption capability by allowing increased swing arm travel. As depicted here, the axle offers fully independent suspension and virtually eliminates side to side shock transfer. 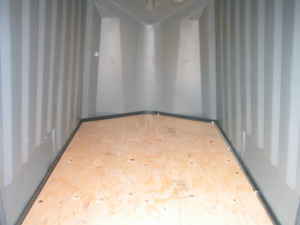 Standard on the low profile Pulmor enclosed trailer. YUPPIE 4 FT. WIDE ROTO MOLDED TRAILER UNITS ARE AVAILABLE IN 5 SOLID COLORS, AND ARE OFFERED WITH A VARIETY OF OPTIONS. SWING OPEN DOOR IN 10 COLORS. YOUR CHOICE, REAR SWING OPEN DOOR OR REAR RAMP GATE. RAMP IS IDEAL FOR WHEEL CHAIRS 2, 3 & 4 WHEEL BIKES, TO MEDIUM SIZE ATV'S AND GAS & ELECTRIC SCOOTERS AND GO KARTS. 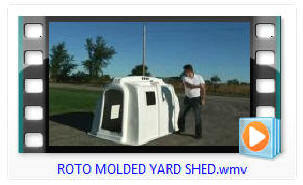 IT IS NOW GETTING POPULAR WITH THE LAWN SERVICES THAT WANT TO KEEP THINGS SECURE IN A LOCKED ENCLOSED UNIT. CUSTOMERS LOVE IT FOR SHOWS, FLEA MARKETS ETC. PONTOON TRAILER SALES PRICED ON ALL SIZES. OUR TRAILERS BUILT TO BE THE BEST ! 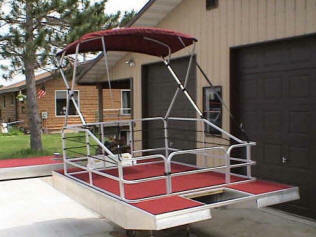 WATERCRAFT ATV AND UTILITY JON AND VEE PONTOON TRAILERS. 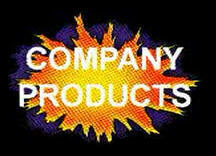 MORE PRODUCTS WE MANUFACTURE BELOW. WITH IN-DEPTH INFORMATION. NOT ALL ITEMS AVAILABLE FROM EVERY DEALER. 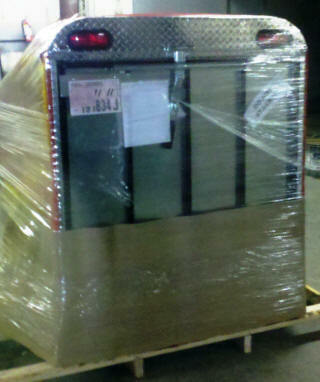 WE CAN CRATE IT UP AND SHIP DIRECTLY TO YOU. OR PICK UP AT LOCAL FREIGHT TERMINAL. 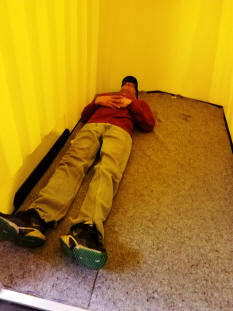 THIS IS WHAT THE 12 FT. MODEL LOOKS LIKE IN THE SHIPPING CRATE. THE BOAT ONLY WEIGHTS 255 LBS AND THE FURNITURE YOU ORDER IS SHIPPED TO YOU UPS. CHOOSE THE STYLE OF FURNITURE AND COLOR YOU WANT. COUCHES OR FISH SEATS. STEERING HELM AND STEERING WHEEL. IN SOME AREAS WE DELIVER ON OUR OWN TRUCKS. HERE IS A PONTOON BEING ASSEMBLE BY THE TRUCK DRIVER AT THE LAKE. TRUCK HAS SPECIAL SWING BOOM TO UNLOAD BOAT AT YOUR HOME, WORK, OR LAKE. COLORS ARE RED, GREEN, BLUE, GRAY, AND AQUA. THE STANDARD MODEL IS RATED AT 5 HP. AND CAN CARRY A LOAD OF 800 LBS. THIS COULD BE YOU IN JUST A FEW DAYS ! 12 FT. NEW CONCEPT LOGOBOAT WITH 4 PONTOON COUCHES. 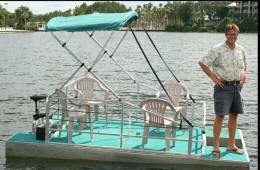 NOTICE THIS PONTOON HAS A 3 HP TORQEEDO ELECTRIC MOTOR. A CHARGE WILL ALLOW YOU TO GO 11 MILES. RUN TIME AND DISTANCE CAN BE EXTENDED WITH OPTIONAL EXTERNAL BATTERY OR SOLAR PANEL. YOU BUILD IT 11 FT.
12 FT. X 6 FT. WIDE NEW CONCEPT PONTOON AND TRAILER & MOTOR WEIGHTS ONLY 655 LB. THE HOME OF BEST BUILT AFFORDABLE NEW 18 FT. WIDE PONTOONS! Lightweight: Easy to tow, easy to maneuver. of sports equipment on top. PULMOR TRAILER FEATURES SLOTS IN THE SIDE SO YOU CAN ADD UP TO 6 DIVIDERS OR TURN TRAILER ON END AND USE AS A STORAGE UNIT. WE HAVE A MODEL JUST FOR YOU AND EASY PAYMENTS FROM ABOUT $48.00 TO $89.00 A MONTH. DURING THIS SALE, USUALLY NO DOWN PAYMENT IS NECESSARY. 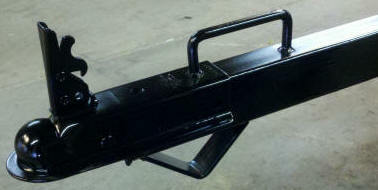 OPTIONAL 2X2 RECEIVER FOR BIKE RACK AS IN PHOTO. NEED A BIKE OR 2? WE EVEN PUT THAT IN THE MONTHLY PAYMENT WITH CAMPING, GEAR, ETC. JUST TELL US WHAT YOU WANT TO DO.